They may be a little on the pricey side, but Tiger JNP rice cookers are worth every penny! If folks seek a well-built and hassle-free cooker that will not boil over and cook good quality moist and fluffy white rice these models make a fine choice. They have a solid build and will fit right in with the decor of your kitchen (should you fancy the flowers). Plain and Simple Does not Mean Poor Quality! Now don’t be fooled by the plain white and “flower blossom” design! These cookers are real workhorses and can accommodate anywhere from 3 cups to 10 cups (9 to 30 cups cooked) of white rice depending on the model. They will perform well for many years, and during our research several owners report an average lifespan of 12 years and over…still going strong. Unlike other cheaper units they will always maintain rice consistency throughout the years. Once you have perfected the water to rice ratio to your liking, you will have a perfect batch of rice every time. The Tiger JNP series utilize even surround heat cooking due to the quality construction and well insulated design. The simple one switch lever makes it easy to start cooking without having to go through multiple menu selections and rice settings/textures. Just measure, plug, press, and forget. Once the rice is finished, the Tiger JNP will switch to a generous “keep warm” mode which will keep rice moist for hours until you’re ready to serve. We would also like to state when cooking brown rice, wild rice, mixed, jasmine, etc., like with all rapid-boil style cookers, there will be a slight learning curve to get it to your liking. slight trial and error when cooking brown rice, mixed, jasmine, etc. We believe these rice cookers are the way to go when regular white rice is on the menu daily for folks feeding a household of any size. Simply put, there are currently very few single switch models that could offer more in terms of rice quality, cooking time, and durability. 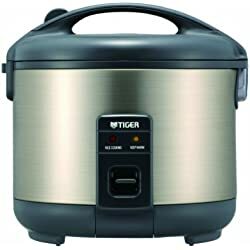 They may just be one of the most reliable rice cookers of their kind on the market…and it is too bad Tiger JNP cookers do not offer a steaming feature, but perhaps this would have altered quality since the unit utilizes a tight seal in order to cook rice evenly? To add in a personal note, I have experienced slight rice crusting on bottom layer, but this so far has remained mild and does not in any way affect the texture or flavor of my rice. A huge improvement over my Cuisinart CRC-400! Overall, this product is recommended!